In this guide we are talking about designers from Europe and USA who create illustrations, picture books and covers for children. Here is a list of famous children's book illustrators and their inspirational quotes about creative process. Let’s have a look at how they began illustrating children’s books! In addition to graphic design activity, Greg Matusic works in children's illustration area. His professional interests and inspiration root in comics and cartoons that he has loved for ages. Nowadays Greg lives in New York cooperating with clients and students and draws so you don’t have to. I’ve been concentrating on children’s books recently, signing with a great rep out in Chicago, Jodell Sadler of Sadler Children’s Literary. I also hold down a day job at Upside Collective where I’ve got my creative paws in almost everything – design, illustration, animation, web edits and project management. Jannie Ho (also known as Chickengirl) is an full time designer specializing in children’s book illustration. She makes art books for children and some educational stuff for kids, which you can find on her website chickengirldesign.com. One of the recent Jannie's illustrations is her 52pp activity book Violet Rose and the Surprise Party and an interactive book of sing and smile stories Wheel on the Bus. Every book that she designs develops imagination, love for reading and creativity in children. I earned a BFA in illustration at Parsons in New York. Afterwards, I worked as a designer at Nickelodeon and Scholastic, then eventually an associate art director at TIME Magazine for kids. I decided to leave in 2007 to illustrate full-time. Since then I've created art for many children's books, toys, apps and many products, mostly for kids. I've always created art that are a bit more fun and innocent, so going into the children's market was an easy choice. I create mostly work for children so my inspiration now comes from my preschooler. It is a little cliche but I definitely get a better sense of what is needed and/or currently missing in the children's market. Natalie Hughes is a children's book illustrator based in Bristol. Her love to illustration in childhood brings her to the children book illustration market. Thus she is represented on The Bright Agency website. See her eye-catching children's books such as The Map Collouring Book, A Life in the Sky, The Falling Acorns in her illustrator's portfolio. A childhood of doodling, daydreaming and exploring eventually lead me to study Illustration at the University of Gloucestershire, where I realised I wanted to work in design and specifically Children's books because they're the most fun! There is not so much information about Adrian Mill in the Web. Anyway, Workspiration chief editor was lucky enough to take an interview in which Mr. Mills talks about his own children illustration experience. I'm a artist and draw children's books and bears. I studied at Cambridge school of art in children's book illustration. I started a long time ago in graphic design (bc) in rugby, before computers in which I learn to draw freehand and the lay out of how's things fitted on the page. After a break (a morning postman) I went to learn foundation in Hastings before going to a BA(hons) in fine art in Sunderland and finally going to do a Masters in children book illustration in Cambridge. So a lot of studying in all areas of art. Clive McFarland is an illustrator living and working in Ireland. 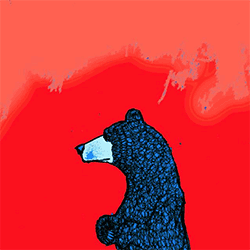 After studying in Liverpool School of Art and Design he published his first children's picture book about Bear Bernard that New York Times called a “witty and warmly told tale”. Just look at the funny short teaser about this picture book. My debut children's picture book, 'A Bed for Bear', is being published in 2014 with HarperCollins. Some of my favourite children's books are by Tomi Ungerer; I discovered his work as an adult and feel I would have loved his books when I was a child. I admire the work of illustrators Roger Duvoisin, Edward Gorey, Tove Jansson, Oliver Jeffers, Jon Klassen, Leo Leonni and Kevin Waldron, to name a few. Mostly I make children’s books. It is unusual for me not to be drawing an animal on any given day! Really like the children’s books my compatriot Chirs Haughton makes. I see my friends Oliver Jeffers & Jon Burgerman here creating their art & that is inspiring to be around. Dave Shelton is a famous cartoonist from Cambridge, UK. He published some children art books such as A Boy and a Bear in a Boat and DFC Library: Good Dog, Bad Dog, which we definitely recommend to look at! In his interview Dave reveals the secret of his source of inspiration. I started out as an illustrator, managed to spend some time writing and drawing my own comic strip and from there drifted into writing and illustrating my own children’s books. Joanna Scott is an Illustrator of children's books from the UK. She illustrates both for publishers and authors appearing on live TV to cast a little light on the art of illustrated books character creation. She collaborates in particular with such international clients as Shreds for Harrods and Selfridges, Paddington & Co, etc. I'm mainly focused on the children's publishing market, though I do work on other sorts of publications like poetry books for both self publishing authors and publishing houses too. Clients have included Shreds for Harrods and Selfridges, Halcyon Days, Paddington & Co, and award winning children's author Lynne Reid Banks. I mainly work in children's publishing, particularly the young fiction and picture book markets. I've always liked drawing, and at some point in my childhood I discovered ‘children's illustrator’ was a job and decided that I really, really wanted to do that. To be honest, my favourite art place would be a children's department in a bookshop – I can spend hours browsing the wonderful stories and artwork! Paul is a freelance illustrator from Poland residing in Germany. Besides illustrating children’s books he also teaches in the Illustration Summer Residency and works in Children's Books area (The Woods, Last-But-Not-Least Lola and the Cupcake Queens, Write Your Own Adventure Stories...). Just visit Paul's page on Amazon and look at the kid’s stuff by yourself. My work has appeared in newspapers and magazines, as well as children’s books and graphic novels, and includes corporate and advertising projects for both American and European clients. My coloring usually happens in photoshop. For my children’s books I work even more old-school, and do the coloring with watercolors, to give it more texture and warmth. Viviane Schwarz is a well known illustrator of children picture books from London. In her interview on Workspiration she tells about who and what helped her to become a children's book illustrator, her current (2015) art and work environment in which she’s been submerged. Do not be lazy to look at her art books for children on Amazon. I am best known for my picture books. I got my first regular comic strip gig at a national children’s magazine when I was thirteen. Gaia Bordicchia is an italian children's books illustrator. Her books La strada di cioccolato and La piccola fiammiferaia are available on Amazon. So if you like Italian or / and your children learn this language, pay attention to the books illustrated art of Gaia Bordicchia. I sometimes sketch while waiting for my turn at the post office and then a child or an old lady I see there, will be used on the spread I've left on the table before I went out. I believe expressions are very important for a children's illustrator and there is so much people say, without really saying it. The way they stand or hand out a ticket or smile. Jane Foster is a children books writer and illustrator as well as textile designer living in Kingsbridge, UK. there are 7 kids books on her Etsy shop page. My first 3 book deal followed shortly after. This was a book deal with Collins and Brown (who are now called Pavilion books) to write 3 craft books - the first was called Fun With Fabric, the second Creative Craft With Kids and the third has yet to be written. I was also very fortunate to have been given another book deal with Templar publishers here in the UK to illustrate some pre-school board books - these were published May 2015 and are 123 and ABC. I’ve also been working on several more children’s books to be published January 2016. I’m a completely self taught illustrator – this may have been a huge advantage to me and my work as I’ve never really known harsh criticism. I think I would have struggled at art school - instead, I just draw my naive childlike illustrations in my own little bubble, not looking at anyone else and not comparing. I’ve been able to stop the frantic toy making and stuffing that was my bread and butter for years to concentrate on new designs. I also think the children’s book deals have also coincided with this slight path change, enabling me to focus more time on the actual drawing. Rachael Saunders is an illustrator and full-time doodler based in the UK. You can find some of Rachael’s works for young audience in her portfolio, including posters, books and book covers. Her first book for children, Pop-up Kings and Queens, was published on Walker Books, and can be ordered on Amazon. I specialise in children’s illustration, but have had the pleasure of working with a wide variety of clients on projects of all shapes and sizes. My work is often described as being whimsical and ‘made from sunshine and rainbows!’ I guess this isn’t too fair from the truth as I enjoy creating illustrations that are full of fun and that will put a smile on your face. I do love a good bookshop and can spend countless hours in the children’s section, devouring the pages of many stories, old and new.